Sharp and eloquent, you know what you want this month, and that will make it much easier for you to get it. Your focus is clear, and your mind is processing information fast. A very good month for learning new skills, languages and picking up new techniques, both mental and physical. You are skilful with words and can use that to debate effectively or think up ideas fast to get yourself out of a corner – quick thinking saves the day. In sports, you can be very successful, especially where tactics and being able to think on the spot are required. This is also a great month to improve in skills, i.e., your golf swing, tennis serve, French pronunciation, your vocal range (if you are a singer), etc. Once you have made up your mind, you can be very dogmatic; in fact, you can be so set on some ideas that you can withdraw from people who do not agree with you. You can be very persuasive and quite relentless about pressing your point of view, and you are rather good at getting your own way in the end. Your persistence and single-mindedness can help you attain personal goals this November. This is an exciting time for love – new relationships can open doors for you and can also open your mind to new possibilities. There is ample opportunity for growth via your one-to-one love relationships, and even in long-term relationships you can take your understanding of each other to a new level. 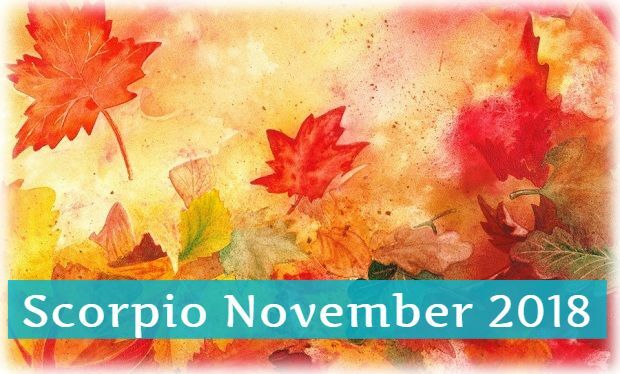 Scorpio are friendly and sociable, which means if you are single you will be placing yourself in the ideal circumstances to meet interesting new partners who have good long-term potential. You are idealistic but also realistic about relationships, which are a great combination as it helps you to see the best in the other person without losing sight that relationships are always hard work, and you have to make compromises. You are eager to talk about feelings and will not hold back or retain grudges, and this means that all your love relationships can bounce back after problems and move on to better things. Traditional morals in relationships are important to Scorpio right now, and while you are quite adventurous regarding the personality types you are attracting, you can still be rather more conservative in terms of the moral side of relationships. You need a certain structure in relationships to feel secure, and you will gravitate to partners with similar values. In more recently formed relationships, differences regarding values and use of judgement can cause a cooling off period. A very good month for problem-solving; this is excellent for Scorpio who work in maths, science and areas where complex issues are analysed, written up and solved. Scorpio are highly insightful and can penetrate through the bull to the heart of the matter. You can have very strident opinions about people that have an almost self-fulfilling effect – if you believe someone is going to fail or disappoint you, then somehow events will conspire to create circumstances where that person fails or indeed disappoints you. Use this powerful mental power to engender positive not negative results. This is a very exciting month for journalists who may travel to cover events of great global importance – these events can also be extremely turbulent and even violent. You will have the opportunity to report from a unique perspective, and you may have some controversial viewpoints. Travel for business or learning can yield some very surprising results. The advice for this month is to stick to your guns but not to shut yourself off from differing viewpoints; do not be blind to constructive criticism.